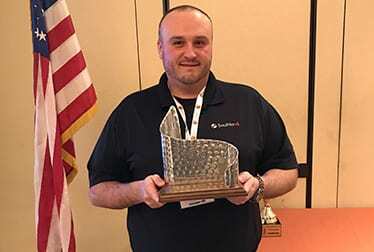 The Sheet Metal Occupational Health Institute Trust (SMOHIT) recently recognized Southland Industries’ Jamie Devan (Division Safety Manager, Mid-Atlantic Construction) at its 2018 Safety Awards ceremony in Tempe, Arizona. Devan was one of only six nationwide honorees. Congratulations to him on this outstanding achievement. The awards recognize outstanding contributions in expanding health and safety programs at the local level for unionized sheet metal workers.